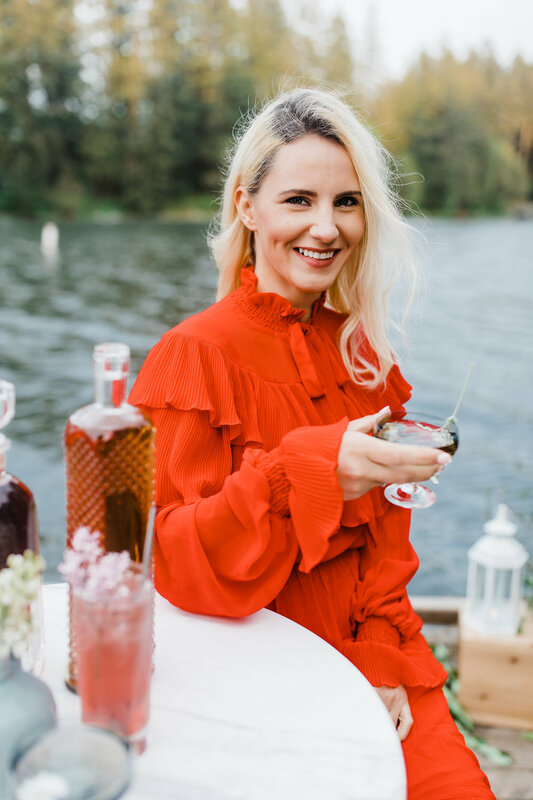 Springtime in Oregon is showing itself these last few days and it reminds us of this particular shoot when we had the opportunity to design cocktails for a lovely and adorably engaged couple. We got to work alongside so many talented people including Sherine from Vintage Meets Modern who brought the perfect touch of style to the luscious and verdant natural background in the meadows and on the lake. While the couple got a little alone time on the water with a bottle of bubbles, we set up for them on the pier with a spread of drinks like our “Honey Do”s and PNW Old Fashioneds. And of course a pic of Melaney just loving her job. This was our first time working with the talented photographer Viktoriya Bogdanova. We’ve worked with her since and are continually impressed by her eye and impeccable ability to capture these moments so beautifully. We look forward to working again with her, Sherine at Vintage Meets Modern, and all the wedding industry pros that made this happy shoot possible. Special thanks to Bramble Floral Design for the beautiful florals and to Vintage Mingle for the cute little menus and stationary. Boat wrangling and wind management by Malia ;) Cheers Everyone!! Behind the scenes with Public Provisions and Vintage Meets Modern.